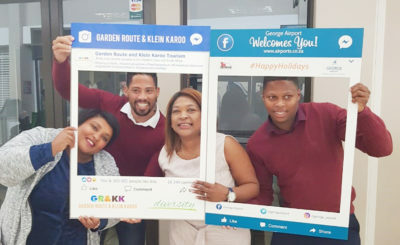 NSRI are urging extreme public caution around the coast over this coming weekend and during the December vacation period and festive season that is now upon us. The FULL MOON SPRING TIDE peaks on Sunday the 3rd December. This being the beginning of the December festive season with Universities and Schools breaking for December and families beginning their December break NSRI are urging public awareness about Spring Tides around this approaching full moon Spring Tide to highlight safety around the coast and general safety to bathers and boaters around the coast and at inland rivers, dams and lakes and at swimming pools. With the approaching full moon Spring Tide beach bathers and shoreline anglers are most at risk. This full moon Spring Tide which peaks on Sunday 03 December means that from about Thursday 30th high tide and low tides will gradually start to increase in intensity, peaking on the 3rd and then gradually declining in intensity until about the 8th. Then the next Spring Tide, a New Moon Spring Tide, peaks on the 18th December. Spring Tide happens twice every month, at full moon and at new moon. Spring Tides bring a higher than normal high tide and a lower than normal low tide, causing stronger than normal rip currents, for a few days leading up to the full moon OR new moon, peaking on the day of the full moon OR new moon and lasting for a few days after the full moon OR new moon. There are two high tides and two low tides every day. During Spring Tide the twice daily high tides are higher than normal and the twice daily low tides are lower than normal and while rip currents are always present the Spring Tide creates stronger than normal rip currents. Rip Currents are caused when the water reaching the shoreline in waves, swells and sea currents retreats back into the sea and this is achieved in rip currents (a river of water retreating through the incoming swells back out into the sea). There are two types of rip currents, permanent rip currents – found alongside islands, rocky outcrops jutting into the sea, at river mouths, in between reefs and alongside harbour walls and piers, are found constantly occurring in the same place allowing the water reaching the shoreline to retreat back into the sea in the permanent rip current and then there are temporary rip currents – found along beach fronts (along the shoreline) and they are forever changing their position and are unpredictable and can form suddenly along a beach front without warning at different places along the shore front throughout the day. During Spring Tide these permanent rip currents and temporary rip currents are stronger than normal and although rip currents at all times pose a danger to bathers they pose the greatest danger during the Spring Tide. Bathers are at risk of being swept out to sea by rip currents while swimming or wading in water along the beach front. Even bathers wading in shallow water who find themselves trapped in a rip current that forms suddenly are at risk of being swept out to sea by rip currents. Bathers caught in a rip current should not panic. Simply stay afloat by treading water (moving your arms and legs in circular movements), don’t try to swim against the current as it will only cause you exhaustion and let the current sweep you out to sea but at your first opportunity swim parallel to the beach front until you are free of the rip current and then use the incoming waves to get back to shore. While this is happening scream for help and wave to alert people on the beach to raise the alarm. Swim at beaches only where lifeguards are on duty and obey the instructions of the lifeguards and only swim within the safe swimming zones lifeguards mark (using their red and yellow flags). Children should have responsible adult supervision around coastal and inland waters. Anglers fishing along the shoreline, particularly along rocks on the shoreline, are at greatest risk during the Spring Tide where incoming waves during the high tides engulf higher than normal over rocks. Anglers should not turn their back to the sea and should be vigilant and cautious of the wave action at all times while fishing. Boaters, paddlers, sail boarders and anyone launching any kind of craft onto water should wear their life-jackets at all times while on water and carry easily accessible safety equipment – red distress flares, communications cellphone or VHF radio with fully charged batteries in water tight plastic sleeves, a waterproof torch, highly visible neon coloured clothing, a referee whistle worn around the neck, and let a responsible person know your time of departure, your exact intended route and your estimated return time and check in with the responsible person on your safe return. (If you are overdue the responsible person should raise the alarm without hesitation). All coastal paddlers and boaters are urged to download the free cellphone application NSRI RSA SafeTrx which allows a user to program their route into the cellphone app and in an emergency alert sea rescue authorities who can determine the exact position of the user in an emergency. Everyone living along the coast or visiting the coast should have their local Sea Rescue Emergency phone number programmed in their phone. 1 Swim at beaches were and when lifeguards are on duty. that you are visiting. They are the experts on that beach. If lifeguards are not on duty do not swim. Swim between the lifeguard’s flags. Teach children that if they swim between the lifeguards flags the lifeguards will be watching them and can help if there is a problem. Lifeguards watch swimmers very carefully between the flags – just wave an arm if you need help. Alcohol and water do not mix. Never drink alcohol and then go to swim. Don’t swim alone. Always swim with a buddy. If you are with a buddy while swimming there is someone who can call for help if you need it and you can’t wave to the lifeguards or call for help yourself. Adult supervision and barriers to water are vital. Adults who are supervising children in or near water must be able to swim. This is vital if it is at a water body that does not have lifeguards on duty. It is extremely dangerous to get into the water to rescue someone so rather throw something that floats to the person in difficulty and call for help (112 from a cell phone and check for the nearest Sea Rescue station telephone number before you visit a beach – put that number into your cell phone). Children should not be able to get through or over barriers such as pool fences to water. Know how to survive rip currents. If you swim between the lifeguard flags they will make sure that you are safe and well away from rip currents. If for some reason this is not possible do not swim. 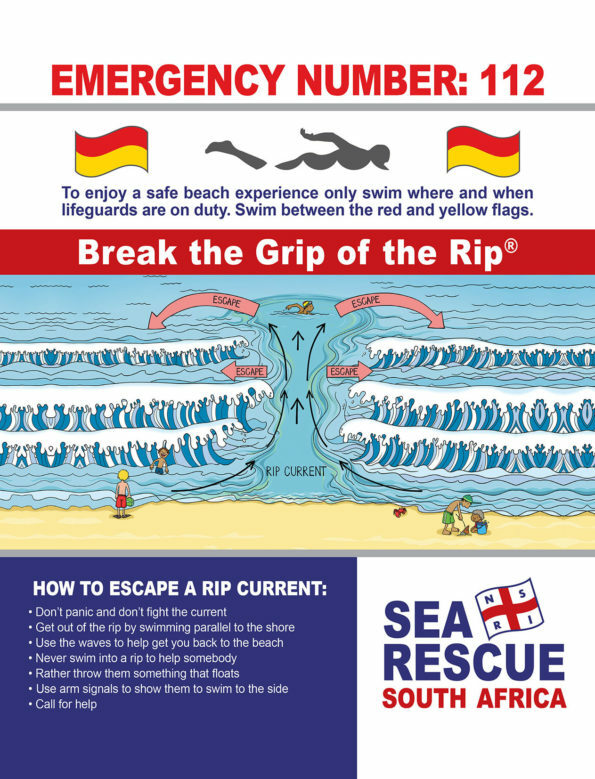 Educate yourself about rip currents, there is plenty of educational material here http://www.nsri.org.za/2017/01/beware-of-rip-currents/ including videos of what rip currents look like. Don’t attempt a rescue yourself. Call a lifeguard or the NSRI by dialling 112 from your cell phone for help. If you see someone in difficulty call a lifeguard at once or dial the nearest Sea Rescue station from your cell phone. You should put this number into your phone before you go to the beach – get the emergency numbers for NSRI here http://www.nsri.org.za/emergency-numbers/ or you can Google for the closest NSRI station emergency number. 112 is a good emergency number – for any emergency – to dial from your cell phone. After calling for help try and throw something that floats to the person in difficulty. A ball, a foam board and so on. 8.Do not let children use floating objects, toys or tire tubes at the beach or on dams. You can very quickly get blown away from the shore and as much fun as tubes and Styrofoam are it is easy to fall off them. If a child can’t swim and falls off in deep water they will drown. Do not be distracted by your cell phone or social media. While you are looking after children in or near water you need to focus on them and nothing else. Adults who are supervising children should not be distracted or use their cell phone. It is not possible to concentrate on children in the water and be on your phone at the same time. Visit a beach that has lifeguards on duty – there is a reason that we have said this twice! Please remember that drowning is completely silent. Someone who is drowning will not shout for help. They will be vertical in the water (like they are trying to stand or climb stairs) and they will then silently slip under the water. Listening for children (or adults) in difficulty in the water is not good enough, you must be watching them very carefully. Make sure that they are not getting in too deep or being moved by currents away from a safe area. Also, be aware in the drought of storing water without safe covers and make sure that they are behind barriers to small children. Especially children under 4 years of age. A small child does not have the strength to lift themselves out of a bucket of water and if they fall into a bucket they will drown. At home make sure that your pool has a child safe pool cover or net and an approved fence that has a double locking gate and can’t be climbed by small children. 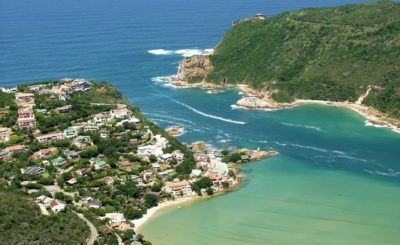 NSRI are urging a safety conscious mindset around all water over this festive season. All Emergency Services are committed to ensuring a safe festive season and we wish everyone a safe season.